Fresh, culinary herbs make all the difference in the kitchen. When it’s bright and sunny outside, having them grow in your yard or pots on the patio is easy and fun. For many of us, winter makes up 5-6 months of the year. Winter’s harsh temperatures, snow and ice may make it seem like an unfriendly landscape for growing plants. With a little innovation, you can continue growing fresh produce and culinary herbs throughout the coldest season of the year. Indoor herb gardens have become more and more popular as people have realized the deliciousness that fresh herbs have to offer their home cooking. 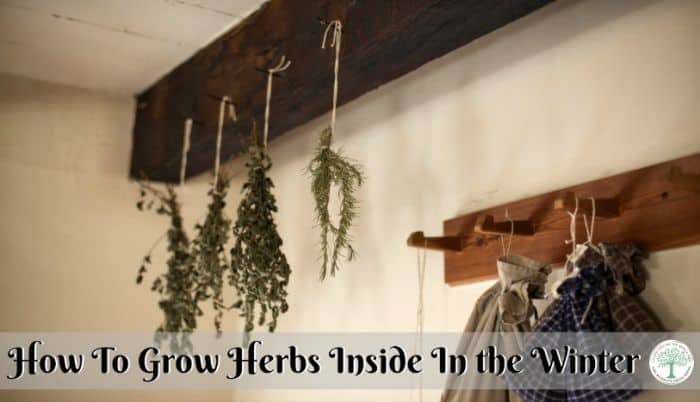 Herbs are easy to cultivate inside once you get the hang of gardening indoors. So you can acquire your indoor green thumb, here’s an easy how-to guide for starting your herb garden this winter. Read more on indoor gardening here. There’s a reason why your herbs won’t grow outside in the middle of winter. The majority of them are from the Mediterranean area, which means they’re bathed in sunshine and warmth almost year-round. As such, it’s important for you to find the sunniest window in your home and set up your garden there. As a rule of thumb, look for a spot that receives around six hours of sunlight per day. In many places, of course, this won’t be possible. If your winter will be a bit gloomier than the required six hours of sunshine per day, invest in some grow lights to give your herbs the rays they need to thrive. Winter is notoriously hard on your skin, and that’s because it’s a one-two punch of dry air at all times. When you’re outside, the frigid air is devoid of the humidity that keeps your skin supple in summer. And then, once you go inside, central heating wicks away whatever hydration is left. Your plants need even more humidity than you do, so be sure to keep up with their hydration. You can start by investing in a humidifier, which will keep both your plants and your skin nourished and moisturized. You can also mist your plants with a spray bottle or place the on top of a gravel-lined, water-filled tray so they’re always bettered by the growing power of water. As you start planning your indoor garden, you’ll obviously have to think about what you’ll put in there. You should, of course, consider the herbs you use most often in your kitchen. But you should also do some research on which herbs are easiest to grow if this is your first time cultivating plants like these. Fortunately, the flavors on the list are some of the most commonly used. Fill your indoor garden with basil, mint, parsley and rosemary, among others, and you’ll find that it’s easy to maintain and harvest herbs all winter long. Once you’ve settled on the location, picked up a humidifier and chosen your herbs, give them a little extra nourishment so that they grow strong and flavorful. You don’t have to pick up artificial fertilizers or pesticides to do it, either. You can make all-natural fertilizers from food scraps, eggshells and more. Using non-toxic, all-natural fertilizers keeps their children safe and their crops nourished all year long. Get more help composting here. Once you have all of the above steps finished, all you have to do is sit back, relax and watch as your herbs grow. Most herbs thrive between 65 and 70 degrees, which means they’re typically comfortable with the same thermostat settings you are. To that end, you don’t have to worry about them getting too chilly at night if they’re by windows, which tend to feel colder as temperatures drop. Just make sure that the plants’ leaves don’t touch the panes, because that can make them too cold overnight. With these five steps in mind, you’re ready to start your indoor herb garden. So, go grab some pots, soil and the seeds of your favorite herbs: you’ll have flavorful meals all winter long thanks to your own personal indoor garden in the sunniest corner of your home. Do you grow an indoor garden? What herbs will you try growing this winter? Emily writes on eco-friendly topics ranging from gardening to home renovations. She is also the editor of Conservation Folks. HI Heather, so good to hear from you. This is a great idea! At the moment, I have marjoram in my window sill. I thought it was dead, but it’s getting new little leaves:-). I so happy. The fresh is sooo much yummier.